Lisa’s experience with Pine Tree Society began with her son then expanded into her classroom at Buxton Center Elementary School. 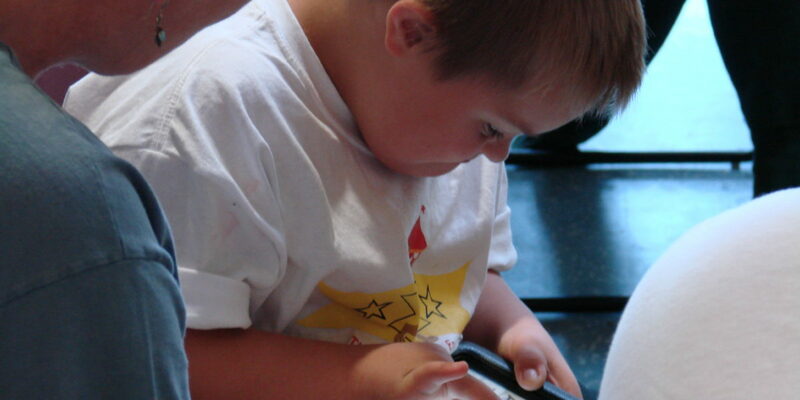 Her son Teagan has Down syndrome, is non-verbal and uses an augmentive communication device to express himself. Pine Tree Society’s Speech, Language and Assistive Technology team started working with him when he was in kindergarten. He’s now 12 years old and going into middle school. Pine Tree Society’s comprehensive approach ensured Teagan’s speech therapists knew his behavior plans so they could immerse themselves in his growth by not just working with his speech goals, but by keeping the big picture in mind and involving the whole family. For Lisa, at home and in the classroom, the Pine Tree Society team always puts students first and never places limits on kids. When Teagan was first learning how to use his augmentive communication device, they were building an addition onto their house. His communication team immediately recognized that as an opportunity to help him learn how to communicate. The Pine Tree Society team helped him develop ownership of his communication by learning what was important to him and showing him how he could share with others. She sees that same level of commitment from the Speech, Language and Augmentive Services team every week with her students at school. They make speech therapy fun, interesting and engaging.